No, we can’t even make this stuff up. Well, maybe someone did, but it wasn’t us . . .
· And most recently . . .
Just days ago it was reported that McGregor was in a bar room brawl with some famous Irish gangsters. If you think this sounds like it should be an important scene out of an old-school boxing movie, we agree. The Black Forge Inn in the Dublin suburb of Crumlin is where the fight was said to have taken place. Some claims have stated that the man assaulted by McGregor was the father of Kinahan lieutenant Graham “The Wig” Whelan. Whelan is one of the country’s most feared gangsters, though there are no specific stats on how many scary gangsters are in Ireland, but it appears that there are a number of them. The unconfirmed reports that have surfaced across European media outlets claim that senior members of Ireland’s infamous Kinahan crime cartel are seeking retribution against McGregor for the incident. Police in the area have been informed of the supposed incident, but since no actual reports have been made, there is nothing for them to do. The last time the Kinahan gang and McGregor were seen on the same headline is when reports surfaced that 59 members of the cartel were flying into Las Vegas, Nevada to watch McGregor’s boxing match against Mayweather. This excluded members who were still exiled or in hiding. Ties to boxing are strong in the Kinahan gang. Daniel Kinahan, who is the grandson of cartel founder Christy Kinahan, has been a boxing promoter and manager for some time. The Marbella Gym, which was started by Daniel Kinahan is estimated to be home to 100 or so fighters. Early in 2017 Kinahan decided to take a backseat due to bad publicity and the gym has been rebranded under the name Mack The Knife (MTK). The “bad publicity” stems heavily from a boxing weight-in event gone bad, when a rival gang showed up with AK47s to take out Kinahan members. There was only one death in the 2016 attack. Irish fighter, Jamie “The Nuisance” Kavanagh (20-1) was present at that event, weighing in for a fight that would be canceled due to the incident. As far as the UFC is concerned, Conor’s next move should be focusing on a potential fight with interim lightweight champ Tony Ferguson, though there is no official confirmation on the next bout for McGregor. 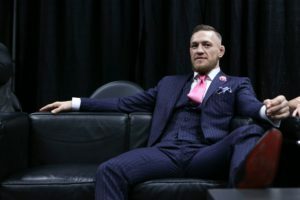 Though he has neither confirmed nor denied the bar room incident, McGregor did acknowledge it on his social media. Initial news reports claimed that a “celebrity” was involved in the fight. McGregor posted a silent video with his face partially covered by his jacket and simply labeled it “The Celebrity.” He has not made any other public comments referring to the event.